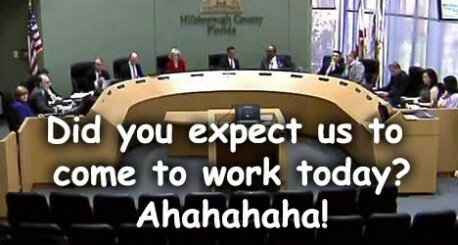 These 3 county commissioners claim the money didn’t influence their votes, but that’s beside the point. They should not be accepting money from a lobbyist right before they’re going to vote on that lobbyist’s issue. Period. Also wrong: the bundling of “contributions,” ostensibly from the developers’ employees and spouses — who actually say they did NOT donate — make the total “contributions” larger than the legal cap from any one business. 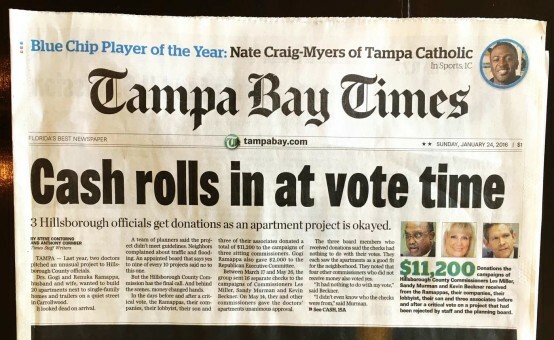 Read the disgusting details in this Sunday’s front-page article in the Tampa Bay Times: Cash rolls in at vote time. Great job digging into the details and exposing this rot, Steve Contorno & Anthony Cormier. Will the county allow sewage dumping on the Little Manatee River? Let’s say NO! Speak up for safe paved bike/walk trails! © Copyright 2014 Mariella Smith. All rights reserved. Web site by InSight.